Add this dining side chair to your eating space for a classy look. 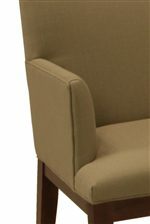 This piece is upholstered and cushioned, creating an ultra comfortable place to sit. Meanwhile, aesthetic features include a tall tight back and exposed and tapered wood legs. Choose from multiple fabric and leather options on the body and wood finishes on the legs. For a complete look, pair this item with the coordinating dining arm chair. 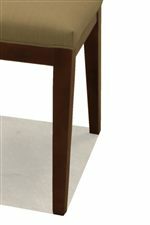 The 0531 Upholstered Dining Side Chair with Wood Legs by McCreary Modern at AHFA in the area. Product availability may vary. Contact us for the most current availability on this product.